Soho is in need of a quality Japanese izakaya. Black Sheep Restaurants has recently opened its first izakaya concept beside Ho Lee Fook, one of the group’s star establishments, on the smaller ground floor space adjacent. If you have a problem looking for the entrance, spot the unmarked wooden screen doors with a white owl-shaped logo at the front. The location is tricky to spot, and this no-reservations restaurant keeps the intrigue going even after you enter the dimly lit square room. On the far end of the room is an open kitchen and bar lined on three sides with high stools. Larger crowds can take the banquettes, which fit four guests comfortably. The restaurant's raw concrete walls are lined with wooden panels around the perimeter. Seasonal vegetables pickled in yuzu is impressive; this melange of bite-sized vegetables features celtuce rounds, carrot batons, daikon radish and cucumber. The zing of yuzu suited the celtuce and radish, ridding the latter of its bitterness and replacing it with the sweet citrusy flavour. Crispy caramel butter corn is a winner. Corn cobs are halved and grilled with butter and sugar until a caramel-rich crust is formed all over, meanwhile the sweetness of corn intensifies into bursting kernels of candy, not unlike caramel popcorn. Chicken karaage, or deep-fried chicken, with umeshu mayonnaise is less exciting, as the chicken was cut into too big and the mayonnaise, mixed with Japanese plum wine, was too sweet and too thin to be the right dipping sauce consistency. 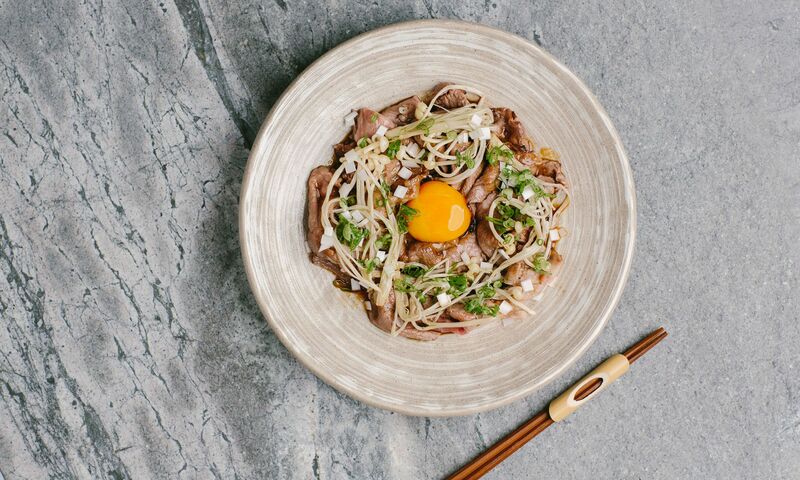 A4 wagyu sukiyaki, however, brought our meal back to a high – thin slices of A4 wagyu beef was lightly seared and topped with an egg yolk that had been cured with soy sauce for five days. The added umami melts into the beef, which would be more succulent if served rarer. Seasonal kamameshi hot pot rice takes a blend of two different types of rice to build complexity in richness and texture. The rice is steamed in a metal pot and topped with fresh scallops and served as is. Guests can scoop their own portions at the table. The rice is mildly glutinous and richly flavoured with dashi, while the scallops were cooked just right, with a slither of rare flesh in the middle. Fukuro presents only one dessert, and it was a winner. The simply titled monaka ice cream sandwich actually features two layers of thin wafers sandwiching a block of seaweed ice cream topped with jam of French cherries. The seaweed ice cream bears a surprisingly umami touch thanks to the addition of soy sauce and just mildly sweet. The cherry jam was a tad sweeter than expected, though the combination worked nonetheless. Fukuro has a short list of sake selections. While most labels can be served in smaller carafes, we opted for the restaurant’s humble selection of highball cocktails, evolving from mere whisky and soda or ginger ale into a more international array of inspired beverages. We ordered the Ken, where dark rum and plum wine is topped with ginger ale. The drink is lightly fizzy and just sweet enough with caramel notes from the rum. The signature Kurafuto is a refreshing one, where mescal is lightened with grapefruit tonic and shiso flowers. Service is friendly from the moment you enter the restaurant, when a unison of “Fukuro!” rings out throughout the petite space. The staff are knowledgeable about the establishment’s menu offerings as well as beverages, especially when it comes to the cocktails and highballs. The service may seem slow when the restaurant is at full capacity and glasses take time to be refilled. The service staff are keen to assist on adding orders and offering pairing suggestions. The ambiance of the restaurant is good but at times the music can be a bit too loud for the enclosed space. With high-quality food and drinks and well-managed concept, Fukuro has proven an early success in the neighbourhood. As one of Black Sheep’s strongest openings to date, it has the potential to be the hottest destination on this side of Elgin Street since Ho Lee Fook.